At the 3D print academy, we believe in empowering your business by sharing our 3D print expertise with your entire team. 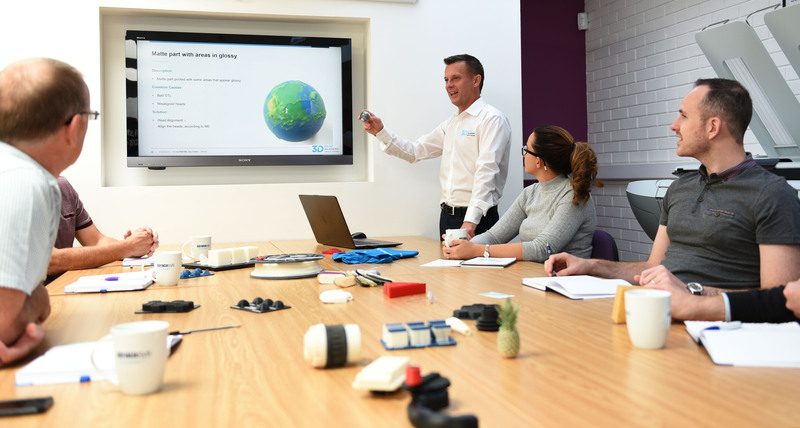 Whilst the designated 3D print operator will usually receive basic 3D print training at the time of installation with most companies, this training is often limited and constrained by time. The 3D print academy offer a wide range of introductory and advanced 3D print training courses which are designed to take your knowledge a step further and introduce your entire team to new ideas and ways of thinking about additive manufacturing. This knowledge and practical experience will enhance your productivity, creativity and adaptability in the market. As you’re probably aware, 3D printing is one of the most disruptive design and manufacturing technologies available today. When used correctly, it has the power to enhance your design stage and streamline your manufacturing cycle, saving both valuable time and money. Yet unless you have integrated it into every stage of product design and manufacturing, you won’t be getting the most out of your investment. Our 3D print training and 3D CAD training courses will teach you how to integrate the design and production stages of manufacturing, as well as creating an awareness of how your 3D printer can be used to streamline the entire product lifecycle from initial design, to prototyping, to creating the end part. Whether you’ve just invested in a 3D printer or you’ve had one for a while, an in-depth technical understanding of how to use the 3D printer is needed for anyone involved in 3D print operations; especially as technologies are constantly changing, being updated and upgraded. In order support both health and safety procedures and to keep up with the requirements of your business, its essential that your teams’ technical knowledge and skills are up to date. Our 3D Print Academy training courses will provide you with an understanding of what materials are available, the possible applications and the best practices required to optimize your design. In addition, 3D print users, designers, and often the entire project team need to understand the technicalities of designing a part for additive manufacturing. There are many important factors which can affect a 3D prints’ outcome which you have probably never given thought to before. These factors can determine the success of your print; such factors can include wall thickness, part orientation and even what print mode you choose to use. Our 3D print trainers can help you to identify the depth of technical knowledge required and recommend the most suitable course. By equipping your project team with the correct technical knowledge, your team will be able to collaborate on tasks efficiently and ensure your’ end to end workflow runs smoothly and effectively. In order for your additive manufacturing operations to run smoothly, it’s important for the decision makers to understand both the possibilities and the limitations of additive manufacturing. Whether you have already invested in a 3D printer or you’re still considering the investment, our 3D print training and 3D CAD training courses will equip you with the knowledge needed to evaluate the effectiveness of a project and ensure you’re future business decisions are 100% backed by proficient consideration. In today’s competitive market, it’s not those who are the strongest or the most intelligent who survive, it’s those who respond best to change. The 3D Print Academy’s 3D print training and 3D CAD training courses will teach you about the wide range of applications available to you within additive manufacturing. As part of the Stanford Marsh Group, the 3D Print Academy is made up of a team who have placed 3D printers into a variety of industries, as well as our CAD technicians and consultancy experts who have designed and implemented CAD solutions into some well-known institutions. This mix of expertise puts us in a unique position to pass on our knowledge and experiences to enable your company to grow alongside additive manufacturing technology. Overall, as part of the Stanford Marsh group, our team of experts at the 3D print academy are in a unique position to offer both introductory and advanced 3D print training and 3D CAD training courses. Our staff provide both 3D software, printers, and services to a wide variety of industries from government to defence, medical, automotive, aerospace, consumer goods and many more, meaning our industry awareness is unrivalled and we can see change coming before it impacts on your business. With this in mind, 3D print training and 3D CAD training courses should be a priority for any business who has already or are thinking about investing in additive manufacturing technologies.